One of the memorable moments in this year’s Dreamforce was Ebony Frelix, Executive Vice President and Chief Philanthropy Officer at Salesforce.org, talking about Quincy, a San Francisco Lyft employee who was inspired to give back using Philanthropy Cloud. The Bay Area has a long and fraught history with homelessness. Some 7,499 people were homeless last year. Quincy often meets San Franciscans who live on the streets. She wants to help. And that's easy to do now that Lyft has adopted the Philanthropy Cloud platform. Quincy can quickly search for housing and homelessness to see relevant articles about the issue. She'll see local opportunities to donate or take action -- at her local United Way or other charitable organizations. Quincy can also connect with other colleagues who care about homelessness, and soon she’ll be able to use Philanthropy Cloud to volunteer and track her own impact. Hearing Quincy's story crystallized for me why we do what we do at United Way, and why we’re so focused on using technology to solve community problems at scale. I’ve been talking about the idea that became Philanthropy Cloud for years now. I’ve spoken about it, blogged about it and tweeted about it. I'm passionate about bringing people together to build stronger communities -- using Salesforce's technology and United Way's reach and problem-solving expertise. Last week’s Dreamforce brought that vision home, and brought to life how companies like Lyft, and employees like Quincy, can use Philanthropy Cloud to make their communities better places to live and work. 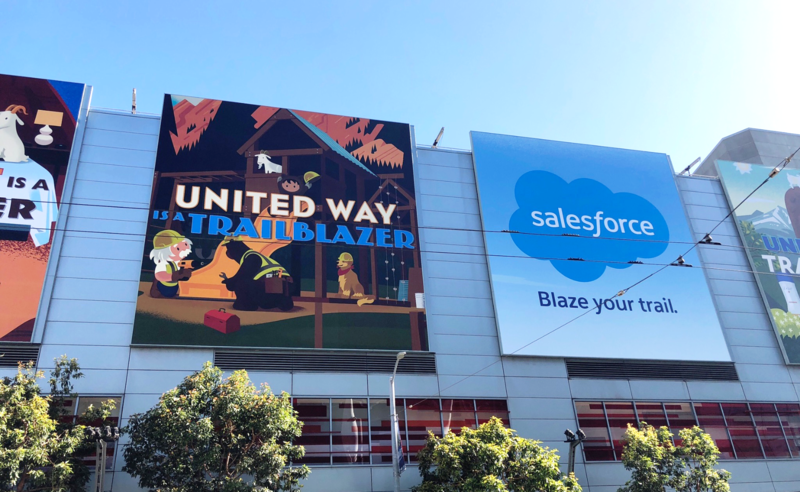 At the Dreamforce campground, for instance, our demo showed attendees exactly how Philanthropy Cloud connects people and the causes they believe in, and how it helps business leaders support employee engagement and community impact. Commitment to community matters more than ever. It's a fact that 92 percent of people want to work for a company that shares their values. And 82 percent of millennials are more likely to recommend their company as a place to work if it encourages them to make a difference on social issues. It all matters. It matters because of stories like Quincy’s. She's not the only one who wants help, nor is homelessness the only problem we need to tackle. Our society is polarized right now. Too many people don’t talk to one another, or when they do, they point fingers instead of shake hands. Technology is being used to divide, bully and inflame. Dreamforce reminds us that technology can be a force for good. We should be using the latest tech to build each other up, not tear each other down. It should inspire us, and help us change our communities, society and philanthropy for the better. You can learn more about Philanthropy Cloud here or get involved with United Way in any number of ways.